The ERC are an alliance of green and environmentalist parties and organizations, founded in 2011 by the Federazione dei Verdi and four smaller organizations. ERC did not contest the February 2013 elections, but the FdV was part of the unsuccessful "Rivoluzione Civile" list. 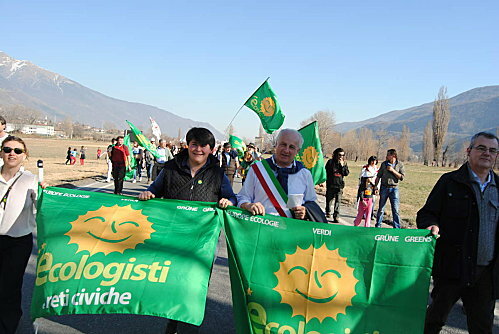 The symbol shows the well-known smiling sun (il sole che ride) on a green field; in addition the alliance name in greenish-yellow and white, and the term "Greens" in several languages (English, German, French, Italian). The flag is a banner-of-arms [1,2,3].